Providing a path to informed consent is the key to better case acceptance among patients. Our wireless Video Otoscope ME-16 increases patient's understanding of their condition by showing the image clearly onto a screen. The wireless feature provides super portability, as you can carry the camera around and diagnose patients anywhere. Nothing is more effective than a SHOW and TELL presentation right on the spot! The ME-16 wireless video otoscope assists you and your patients to realize clarity and practicality in your daily practice. Helping them to visualize a medical condition provides a more thorough understanding, and creates a feeling of comfort for your patients. Even during the examination of a child, a parent can watch the child's condition with the doctor. It leads to trust in a doctor's diagnosis and treatment plans. Those areas a patients cannot normaly see, are exactly the areaa a doctors want to show them. 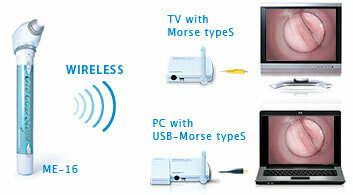 The truely wireless technology eliminates complicated installation or training. Super portability, high quality image, user friendly; it all fits in your hand. The ME-16 works with your existing display device such as TV / computer screen by using RFSYSTEMlab's wireless video receiver Morse (for TV / monitors) or USB-Morse (for computers). The displayed images can also be imported and saved into your imaging software (or patients' files). Do your words of expalanation reach your patients during your examination? Although they will not always admit it, most patients cannot fully understand your diagnostic by your explanation alone . Using a traditional otoscope, you might be able to see what you need, but your patients will never really know what you see. Sharing images and videos with patients becomes the key to true informed consent. Plug and Play system. Only 5 minutes to set it up by yourself without complicated wiring or office modification. Nearly impossible to setup by yourself and office modification or complicated wiring is likely required. All the necessary functions are within the compact body. Not only does the ergonomical design speed up your daily activities, but it also provides a safer, more comfortable and accurate diagnosis for your patients. Too complicated to train your staff. The thick cable on the camera and the size of system is too cumbersome for a hectic daily practice. White LED lights and our self-developed data processor ensure not only sharpness, but true-to-life color images. Most companies still use a halogen light source which provides yellowish color images. 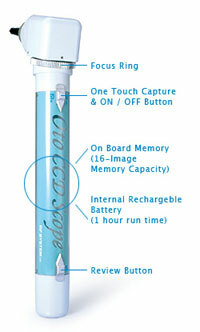 No strings attached and extremely portable just like your conventional otoscope. It can be carried from room to room. Because of the size and cables, it won't let you easily carry the system. Too heavy to carry and / or hard to push the cart around in tight spaces. Affordable price. Reasonable enough for any offices to have 2 or 3 systems. The high quality images can instantly be captured by the CCD sensor. The new SX630 data processor delivers smoother and lower noise images with realistic color. The 16 image on-board memory can store images and review them on the spot. This can help achieve a fast and smooth informed consent process. The focus can be adjusted by turning the focus ring with one finger. Reaches up to 30 times magnification* and acheaves focus on wide range of areas such as ear drum, external acoustic meatus, fauces, etc..
*As seen on a 21-inch monitor. *Specula : different sizes can be exchanged for various uses. Diameters 2.5mm / 3mm / 4mm / 5mm are available /> * Welch Allyn specula can also be used.